There are many things that make an ensemble interesting – and it does not begin with how much it costs. Where it really begins is the interplay of high and low, tough and elegant, masculine and feminine. There is no single piece in your collection that does this better than a blazer. The boys may have invented it, but we do it so much better. Casually thrown over jeans – or with nothing under it for evening (try it, I promise) – the blazer is a workhorse, a signature and your wardrobe BFF all rolled into one. That being said, this is a piece on which you should spend money. With careful choosing, impeccable quality and tailoring and excellent care, this friend will live in your collection for years. Think of the classic navy blue schoolboy blazer – or the fantasy Chanel boucle cropped and trimmed jacket. Both iconic for generations and highly coveted. 1. Sleeves should hit at the top of your wrist for a classic look. 2. Shoulders should be crisp. The seam of the arm should rest easily on the curve of your shoulder. 3. Length should fall to your hip for a classic look, but this should also be based on proportion and personal style. A cropped jacket typically hits just above the hip bone. 4. Fit should be smooth with no pulling or bunching when buttoned. Be sure to look in a 3-way mirror to see the fit all the way around. 5. Only use an excellent tailor for the fitting and alterations. This cannot be overstated. 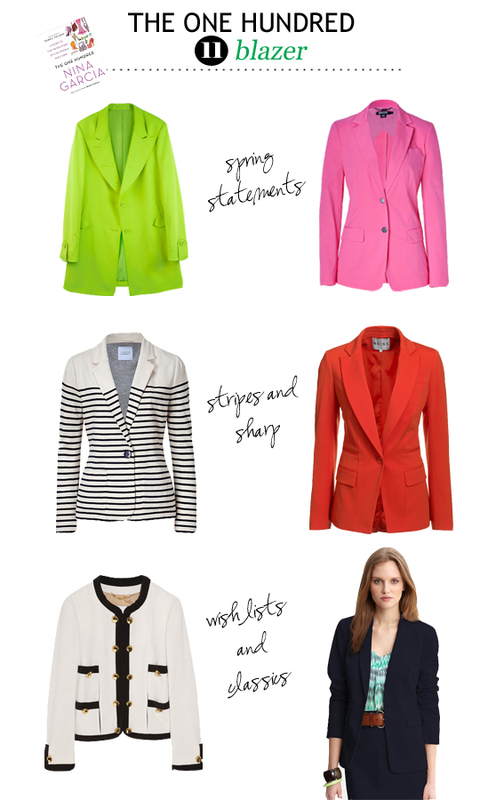 Want to learn more about blazers? Of course you do. Pick up a copy of Nina Garcia’s “The One Hundred” for yourself! We’re working our way through all 100 items to assemble the perfectly stylish, workable collection.